This guest post is by Launceston author Karen Mace, who is also a counsellor, writing therapist and the director of Healing Place. 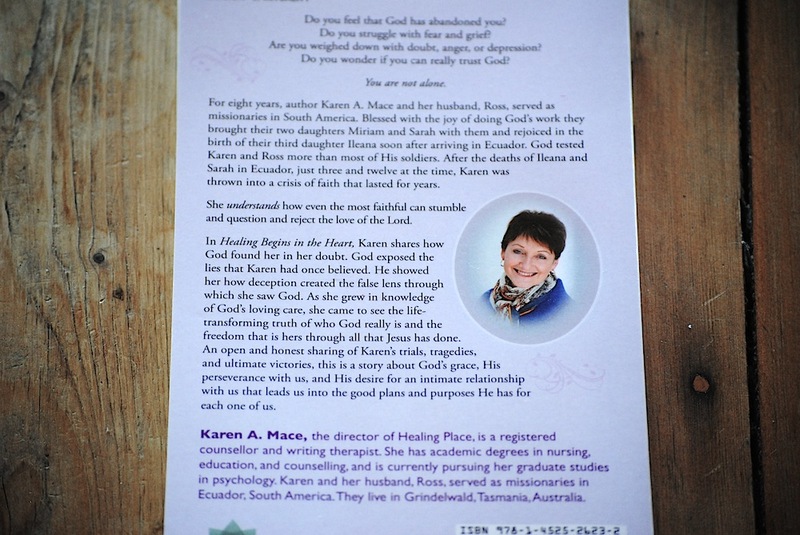 Karen’s book Healing Begins in the Heart (Balboa Press, 2014) is an honest account of her trials, tragedies and ultimate victories after a deep crisis of faith that lasted many years after the deaths of two of her daughters. Karen and her husband Ross were serving as missionaries in Ecuador when Ileana and Sarah died suddenly and tragically, aged three and twelve. In her book (and more briefly in this post) Karen shares how she lives with grief and her ongoing experience of God’s loving care. What would our Family Day be like if they were with us? This year there will be someone else missing from our gathering. My father-in-law, our fun-loving, family-loving, family patriarch will spend his first Christmas in Heaven. People cannot compare grief, and the pain associated with it, but I believe we all know that special holidays challenge the grieving. Christmas arrives like a beautifully wrapped package, one that doesn’t contain something we laugh and rejoice over; this one is full of grief triggers. Empty chairs, missing faces, silent voices, lost dreams. Christmas can be a time of year when longing for the presence of that special person can be overwhelming. Even when we know we will see our loved ones again in eternity, the longing for their physical presence can be so strong at times, it takes your breath away. Over the years through my own experience, through my work as a psychotherapist, and in talking with others I have found that it is possible to make it through Christmas without withdrawing or isolating. Without realising it, when we are grieving we often do this; sometimes as a way of protecting ourselves from the pain of ‘absence’ reminders as so much about Christmas reminds us of the loss we have experienced. Here are some things that may help you if you are grieving this Christmas. Don’t expect too much of yourself. Christmas can’t be the same as it was when your loved one was still present. Rearrange furniture. There may be a favourite chair or sofa that is a constant reminder of your loss. Our young daughter, Ileana (Illy), had a favourite rocking chair and I can still see her rocking so hard she tipped over backwards. After Illy died we moved to another apartment and the rocking chair went into a different room. For me it was a constant reminder that Illy was no longer with us and, for a while, it was better not to have it in the lounge room. Rest. Grief can be exhausting. If possible stay clear of the rush and bustle that happens at this time of year. Care for yourself. When we are grieving we don’t always look after ourselves well, so be aware of this and make good choices about what you eat, getting some exercise in, and also making sure you get adequate sleep. At Christmas especially, there is usually an over abundance of sweet food to tempt us. Try to avoid too much sugar though, as the highs and lows that occur naturally induce emotional lows. Try not to over eat or sleep too little. Don’t try to hide your grief. This is a hard one. I know this seems the easiest thing to do at times. And for those around us it is natural to worry about upsetting the grieving person if you talk about the person who died. One person suggested I put away all photos, all reminders of our girls, so that it wouldn’t be so painful for me. When we lose someone we love, we don’t stop thinking about them, in fact they are still very much a part of us but in a different way. So, if you can, let others know it’s okay to talk about the person who died, and give yourself permission to cry – it’s known to release excessive tension. Trying to avoid grieving, to hide it, just ends up with us falling on our face! I know because it happened to me. And… if you are depressed, admit it. The more you try to pretend it isn’t happening, the more the depression grows. Help others. This is known to be a wonderfully powerful way of us taking our eyes off our own problems, of helping us to look outward instead of inward. When we do this, we connect with others and this releases ‘feel good’ hormones and gives us a sense of well being. Understand the new ‘normal’. You are doing things differently now, and that means learning what that is. As a Christian, I believe God gave me my previous normal, and He has helped me with my new normal. He will, if we let Him, lead us to a place of peace and rest where we can relax in Him knowing that, even though it doesn’t feel like it, life will be okay because God is there with us. It was important for me to remember that difficulties and trials don’t mean that God doesn’t love us, or that He loves us less. A verse I found very helpful is Romans 8:38-39. Christmas can include lots of grief for loved ones who have left or died. But the essence of Christmas is life; the gift of Jesus in our lives. We can let His presence be our encouragement and hope this Christmas. If you are grieving, allow Him to comfort you. My dream this Christmas would be to pick up Ileana and Sarah and to hug them for real. The dream won’t come true today, or on Christmas Day, but it will… one day. Perhaps this year, you could focus on something other than your loss; let Christmas be a reminder of Jesus’ birth to banish death. 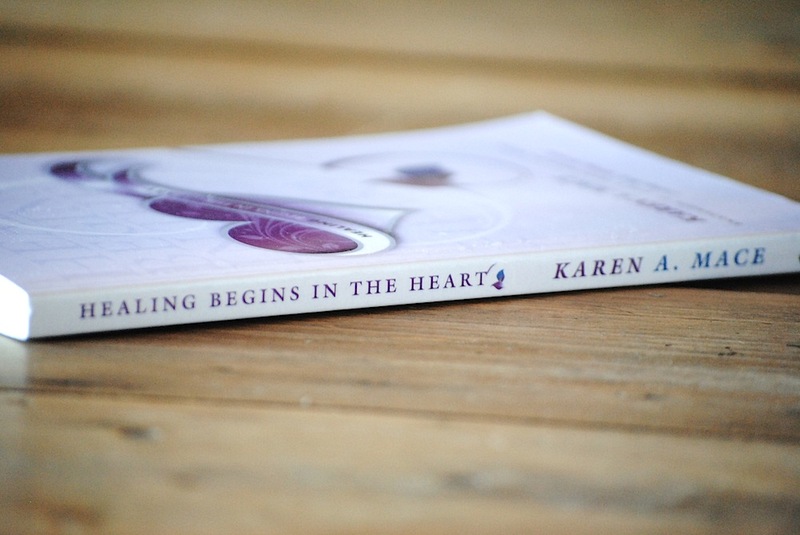 Healing Begins in the Heart can be purchased directly through Karen here (for local Tasmanians), as an ebook through Amazon or through Book Depository. Thanks, Karen, you are such a blessing to so many and your writing is such a gift.